Flip Out Mama: Tablevogue: Dress Up Your Ugly Table! Hey guys, I just wanted to take a minute to tell you guys about an awesome product idea that I just got introduced to. The company is Tablevogue, and the idea is so simple, it's genius! They make table covers for those ugly, plain folding tables that we all have hanging out in our garage/shed that we use for entertaining. I love this idea! I hate having to throw a sheet or some crappy plastic table cloth over a folding table, leaving the legs hanging out and looking, well.. crappy! 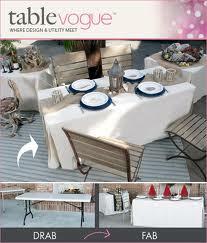 Tablevogue is perfect for turning any plain jane table into an elegant one! What a great idea, right?!? Look for Tablevogue in select Bed, Bath and Beyond stores, or shop online! I really look for this to be the next trend in home entertaining!